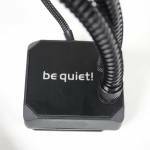 Today we will be taking a look at an Air CPU cooler by way of the Thermalright Macho 120 SBM. 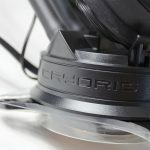 Air coolers have vastly improved over the past few years and nowadays can offer some pretty impressive cooling performance. 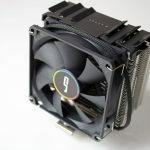 They now also come in a number of shapes and sizes, from the beastly dual tower coolers that offer maximum performance to the smaller top down coolers that are designed to offer better performance than a stock cooler. 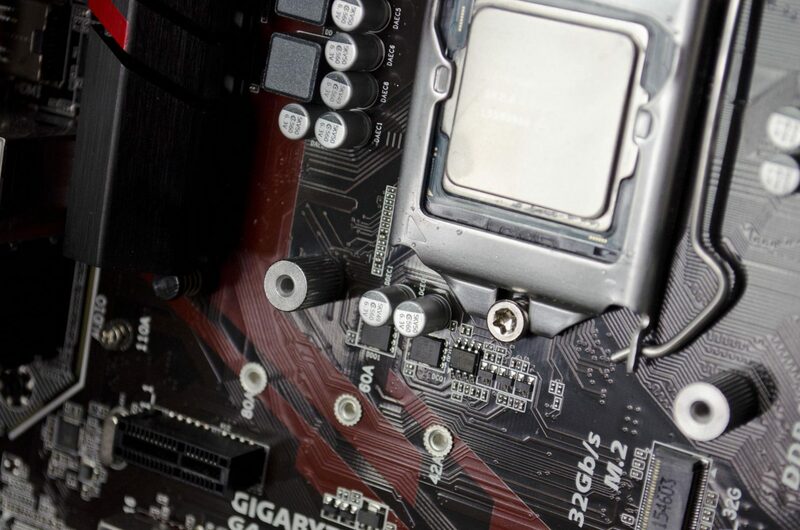 CPU cooling is an important part of any PC build and with a multitude of options available, it can easily become a daunting task. 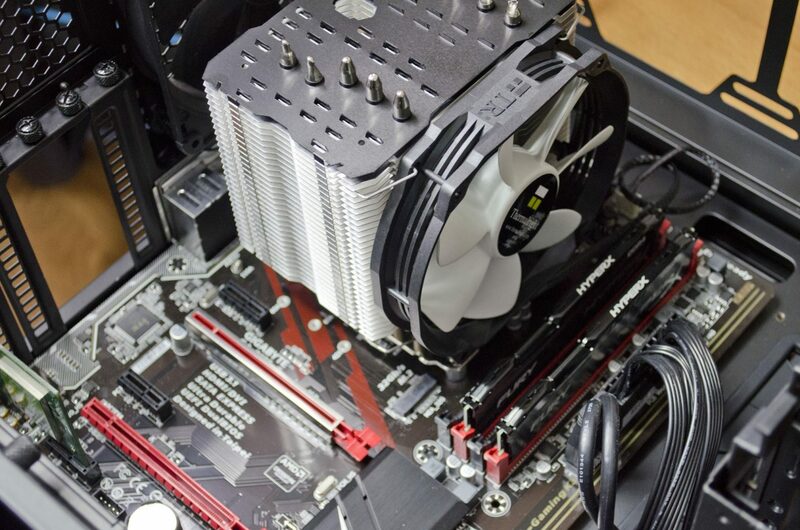 Thermalright’s Macho 120 SBM is a thicker single tower cooler that comes equipped with one fan as stock. 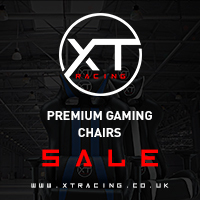 However, for those looking for a bit more performance, it does include the retention brackets for a second fan which you can purchase separately. 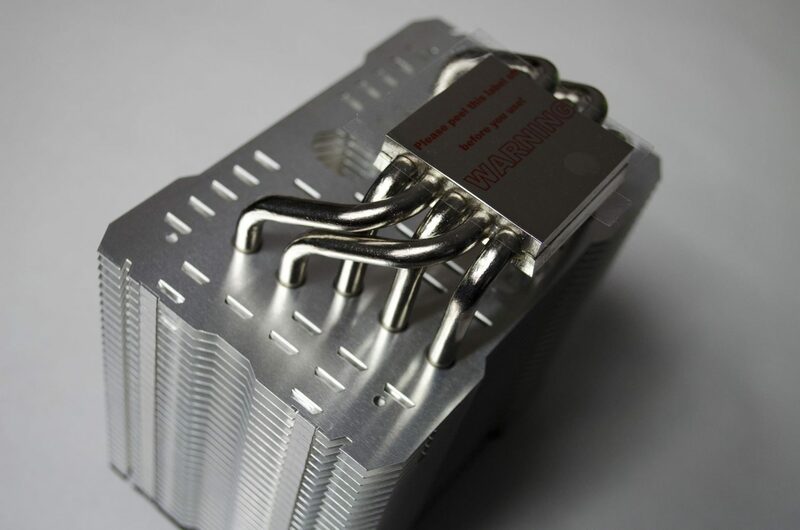 As with most CPU Coolers these days, the Macho 120 SBM will fit on a number of Intel and AMD sockets and is also designed with RAM and GPU compatibility in mind. 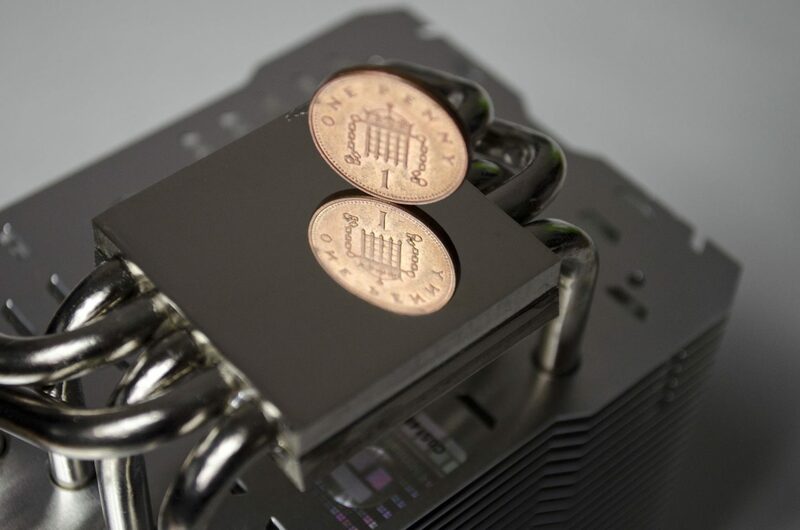 Designed with a nickel plated copper base and 5x 6mm heatpipes, the Macho 120 SBM should provide sufficient cooling for mild/moderate overclocks on a wide range of CPUs. To see how well it does, let’s get into the closer look followed by the installation and some performance testing results. The box has a couple of images around the outside of the cooler and the TY-127 that comes included. 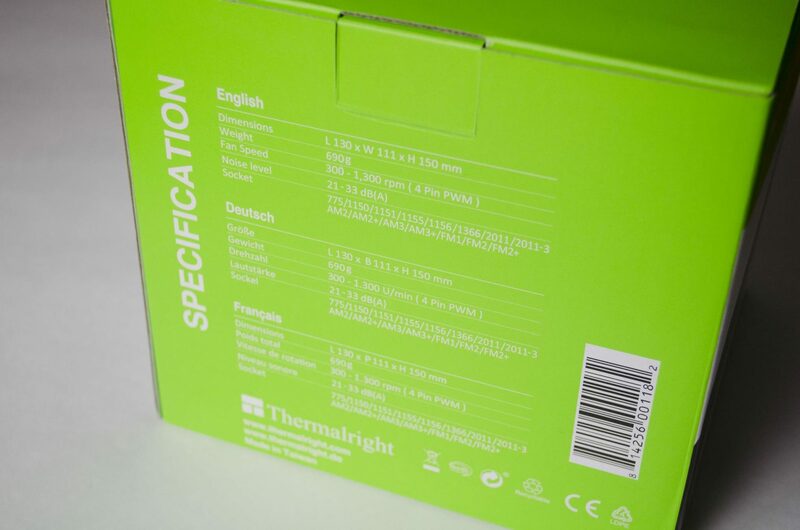 Thermalright has gone with some nice bright green accenting to help draw attention to the box, something I think would work out well if you were in a shop looking at coolers. 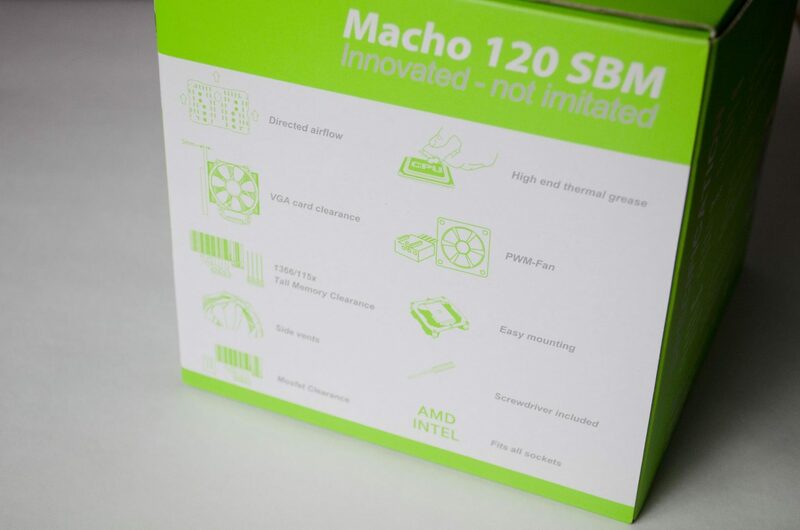 Looking around the box users will also be able to see some of the features the Macho 120 SBM has to offer as well as the technical specifications of the fan and cooler. 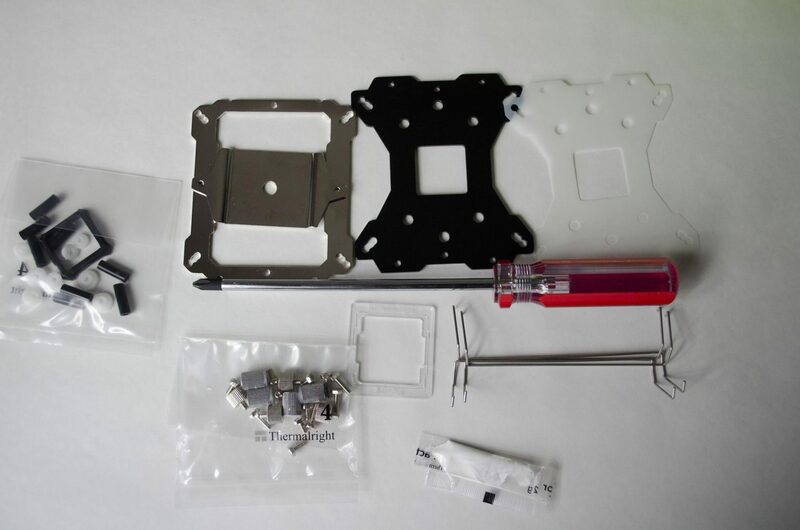 Inside the box is a number of mounting accessories to help you get this cooler mounted on your CPU. 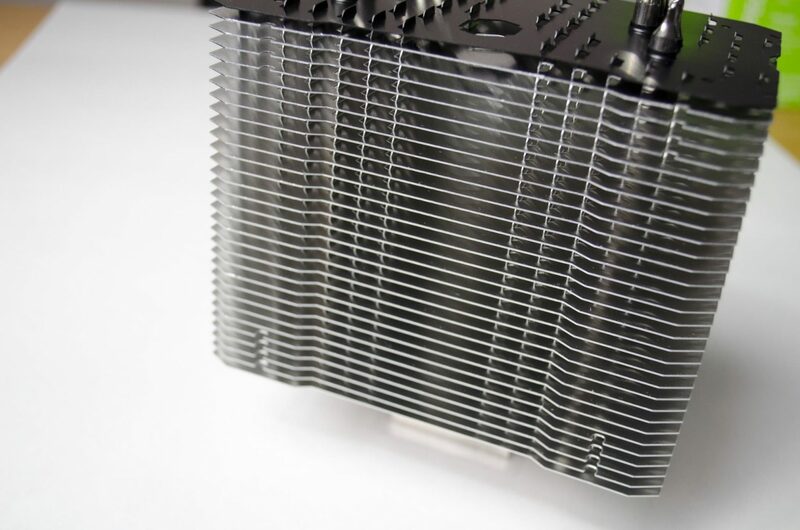 As mentioned, this cooler is compatible with a wide range of AMD and Intel brackets but it is always worth checking if yours is supported just to be sure. My favourite accessory Thermalright includes with most if not all of their coolers is the screwdriver. This screwdriver is one of the most handy tools I have in my tool box and helps with much more than just installing coolers. 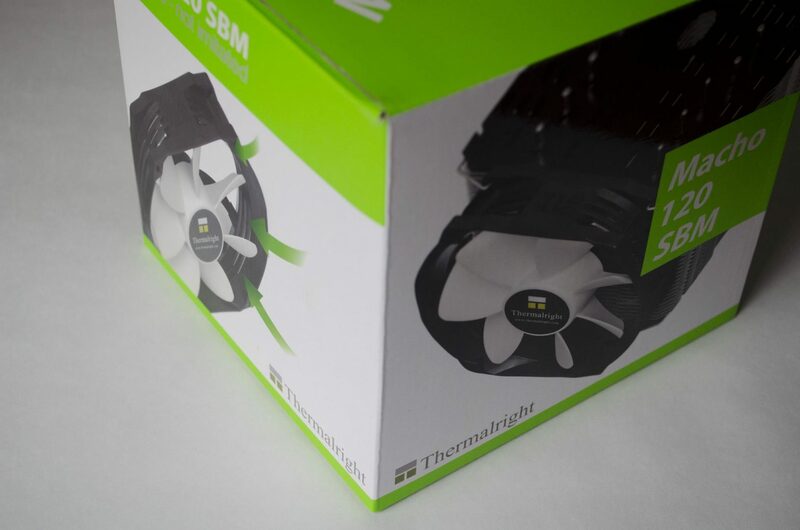 The Macho 120 SBM comes equipped with a single Thermalright TY-127 120mm fan. 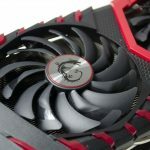 For those looking for a bit more performance, Thermalright have included brackets for a second fan though you will need to purchase the additional fan separately. 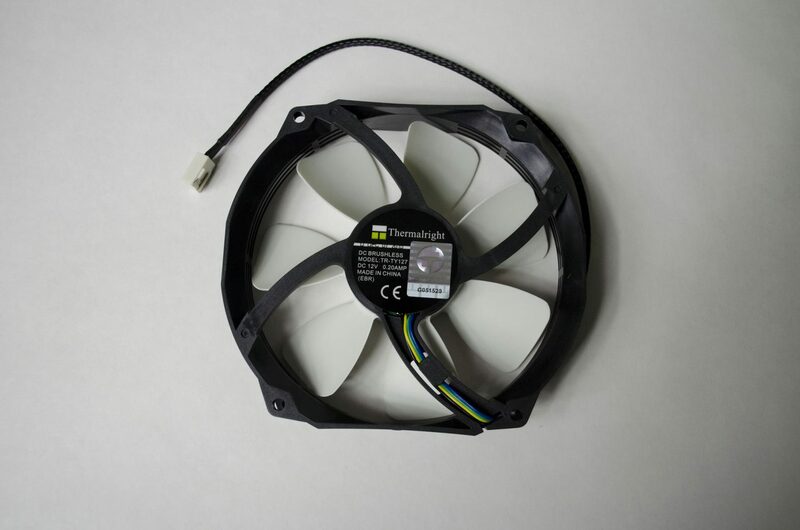 The fan features a black casing with white fans blades and a braided cable that has a white 4-pin PWM connector on the end. 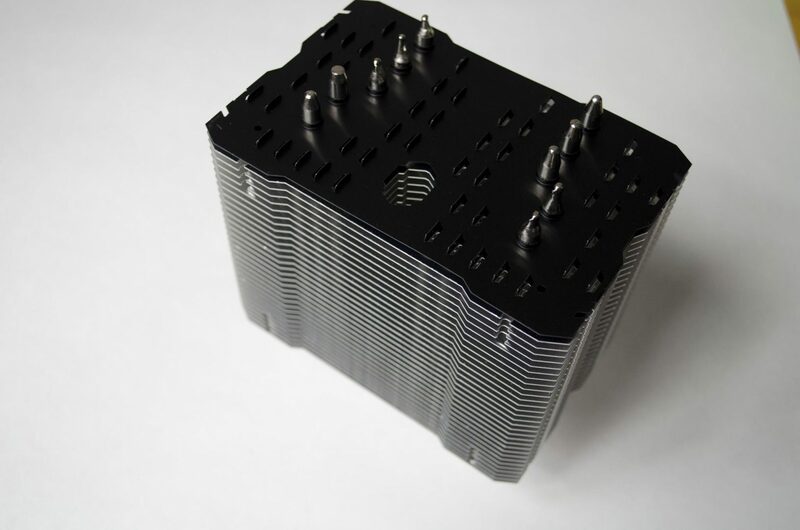 The fin array features a black top fin where we can see the 5x 6mm heatpipes protruding through the top. It’s also worth mentioning the little flaps that are lifted up to allow for air to pass through the top fin. As we all know, heat rises so Thermalright has added some extra holes in the top to let the heat out. As we can see now, all the fins feature the lifted up tabs that will definitely help to all the heat to dissipate up and through the top of the cooler. The fins are nicely spaced and design for maximum airflow. Looking at the bottom and we can get a better look at the nickel-plated heatpipes and baseplate. We can also see that the lifted up tabs do, in fact, go all the way from the top to the bottom. The baseplate has a smooth and shiny nickel-plated copper finish as the penny below shows. 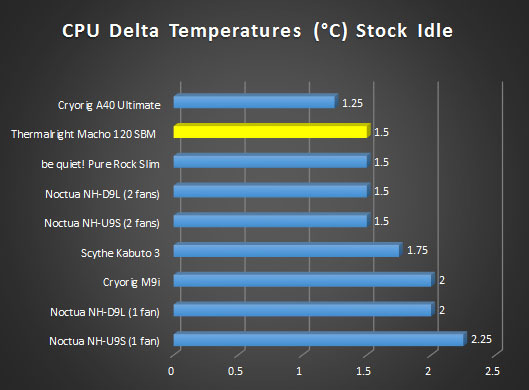 Thermalright have done a great job at making sure the Macho 120 SBM is going to dissipate heat quickly and evenly. As always, we are installing this on our Skylake based test bench. 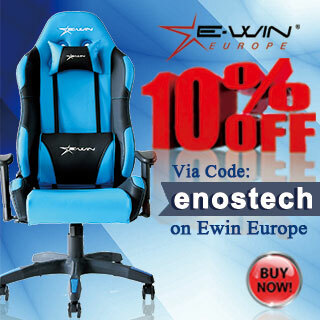 First, you will want to get the backplate ready. To do so, get the backplate and the thing white cover, line them up and push the correct screws through the hole. 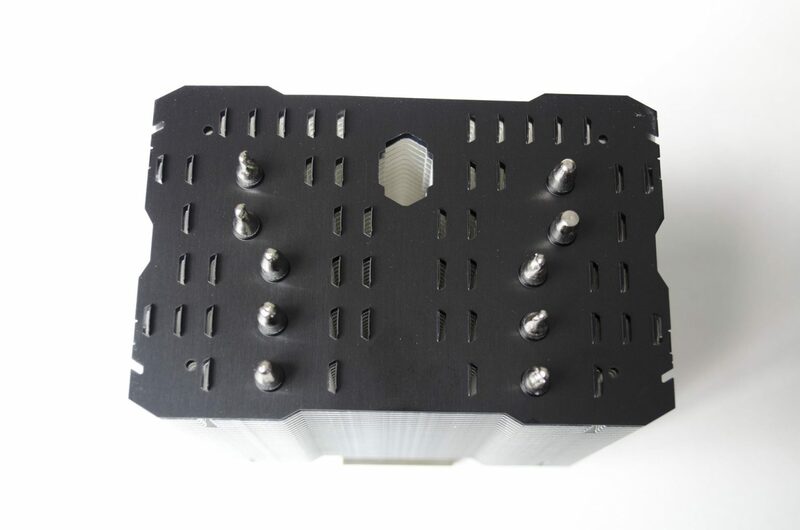 Depending on the socket type you are installing this on you will need to check which hole in the backplate is the one you need. Once you have that figured out and the screw in place, you can secure it by placing one of the white washers over it. 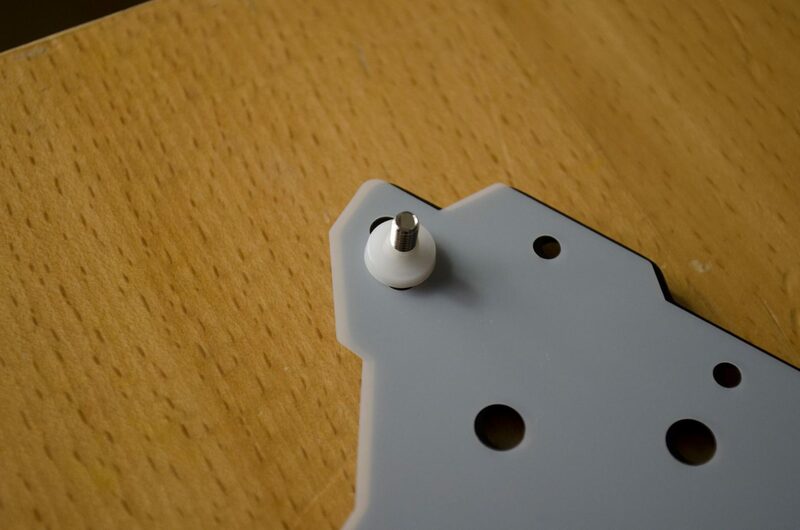 Once you have all four screws in place on the backplate, you should be able to put it on the backside of the motherboard and then use the thumb screws to secure it into place as seen below. Now we want to put the cooler bracket on. this is what the cooler will screw into. To do so, set it atop the thumb screws then use the provided screws to secure it on top of said thumb screws. 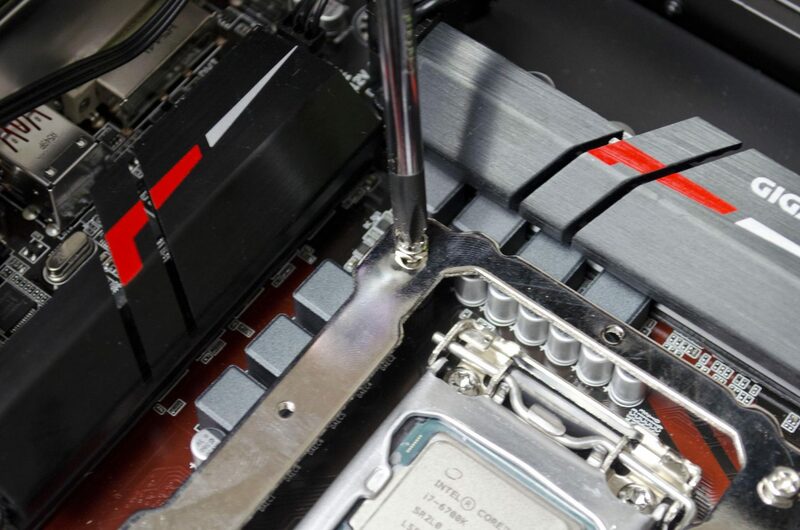 Now, make sure you install your thermal paste, set the cooler on top of the CPU and pass the retention plate across the top side of the coolers baseplate. 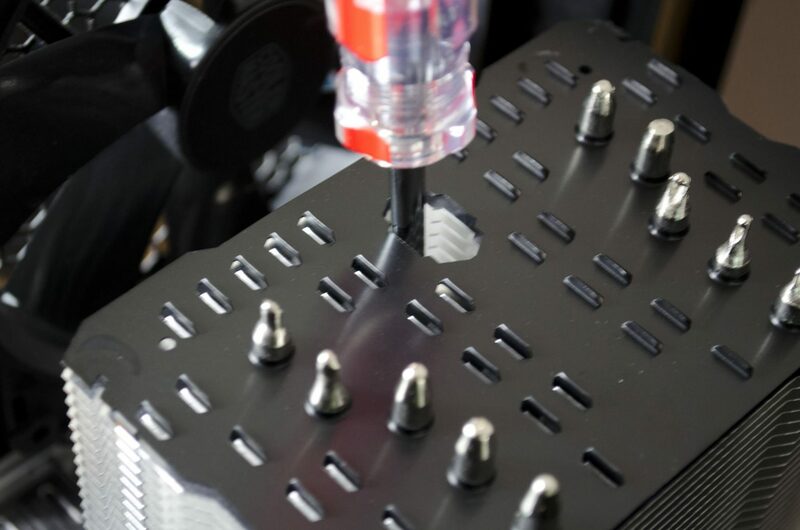 Once in place, you will then be able to screw it into the sides of the cooler bracket we just installed on the motherboard. If done right, you should have plenty of room for RAM clearance thanks to the way The Macho 120 SBM is designed. 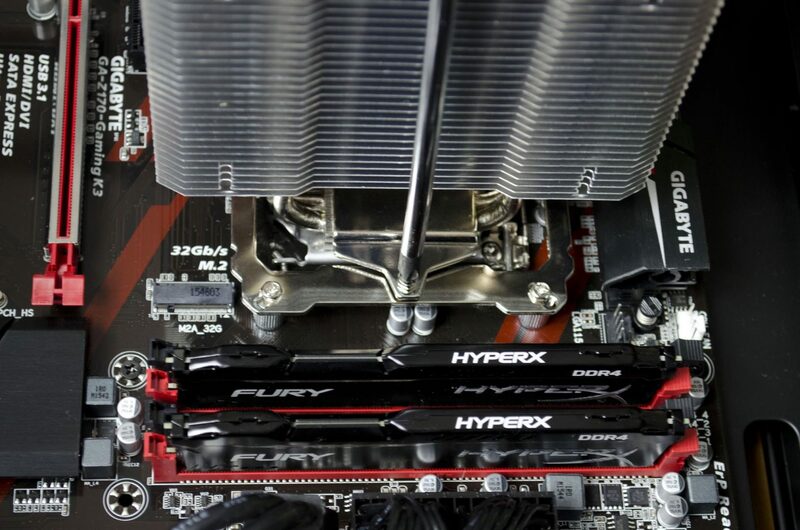 When you go to put the cooler on, make sure you look at the way you install it as one way will sit over the RAM much more than the other. 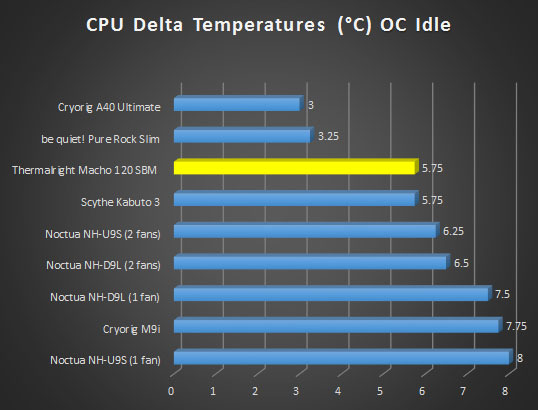 We have put another cooler through its paces on our handy Skylake test bench and it is now time for us to give our final thoughts. 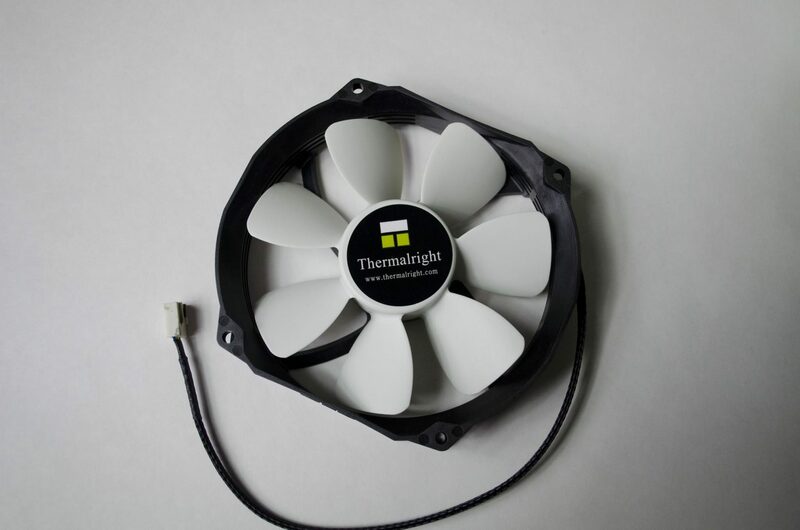 Thermalright are known for producing some great coolers and fans. Their Macho 120 SBM is a great take on a chunky single tower cooler and while it only comes with one fan in the box, this is sufficient to get you up and going, even if you want to overclock your CPU a bit. 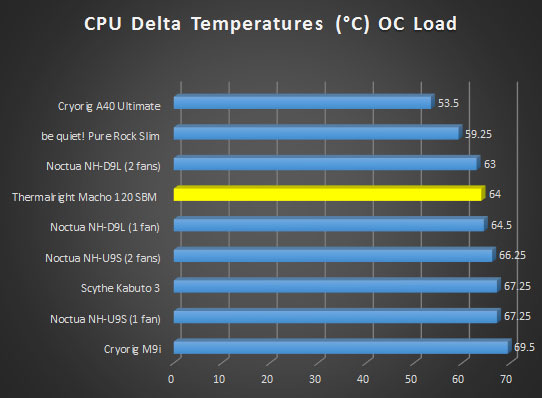 In terms of raw cooling performance, the Macho 120 SBM was more than up to the task of taming an overclock 6700K with 1.4V pumping through it. 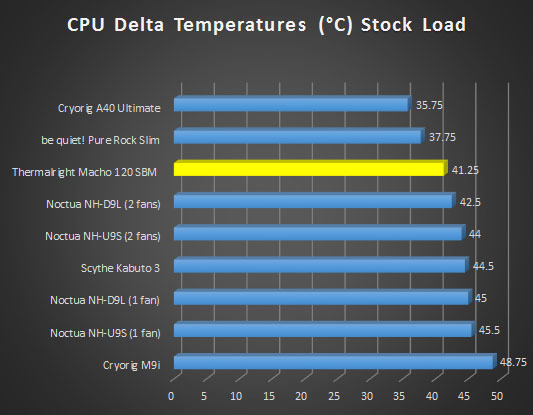 With just the one fan, the cooler was able to keep Delta Temps to 64c when overclocked. 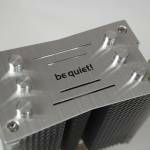 While doing this, the noise from the fan wasn’t overly loud and it was actually one of the quietest coolers we have tested to date. 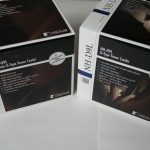 When it comes to idle temperatures, both at stock and overclock speeds, the cooling performance was great and the noise was almost inaudible. 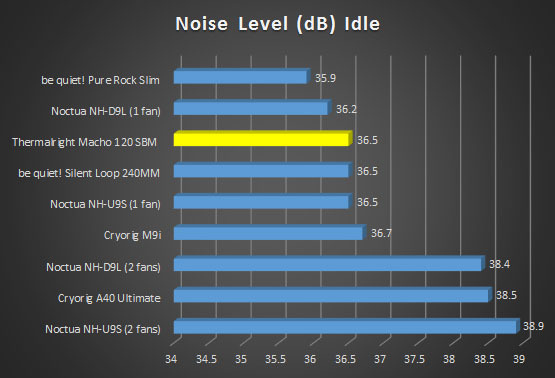 I test the dB of the fan with the side panel of our cooler bench case off and had the side panel been put on, I would say that you really wouldn’t be able to hear this cooler at idle speeds over the other components in your case. Even when fully revved up, this cooler wouldn’t be that loud if you have it properly enclosed inside a half decent case. 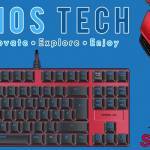 Thermalright have gone for a fairly simplistic design on their Macho 120 SBM. However, there is one major difference from most coolers and that is the addition of the ‘lifted up tabs’ as I like to call them. These extra little holes in all the fins allow the air to flow upwards more freely, thus allow for more efficient heat dissipation. They have also gone with the crowd favourite nickel-plated copper heatpipes and base. 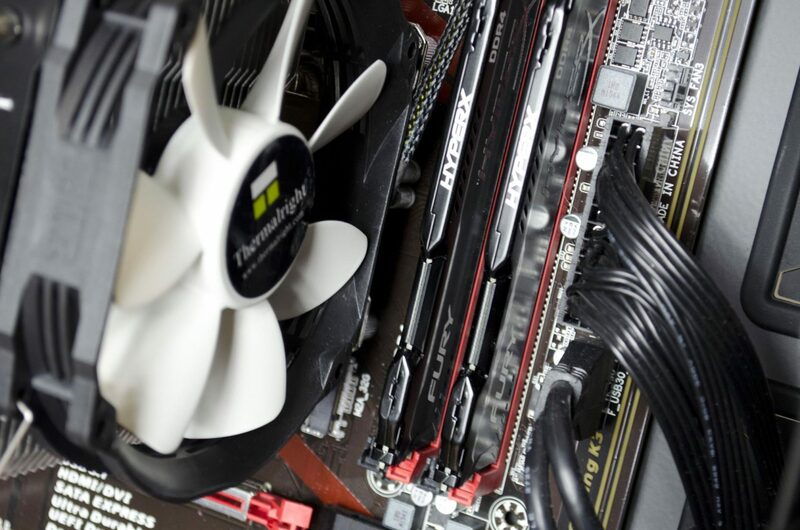 While there is room and brackets for a 2nd fan, the single TY-127 fan does a great job of keeping things cool, even when you decide you want to do a bit of overclocking on your CPU. 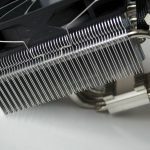 Thermalright know what they are doing and it definitely shows in their Macho 120 SBM CPU Cooler. 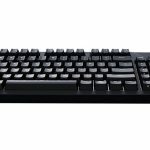 Coming in just shy of £43 at the time of review, the Thermalright Macho 120 SBM is very competitively priced. 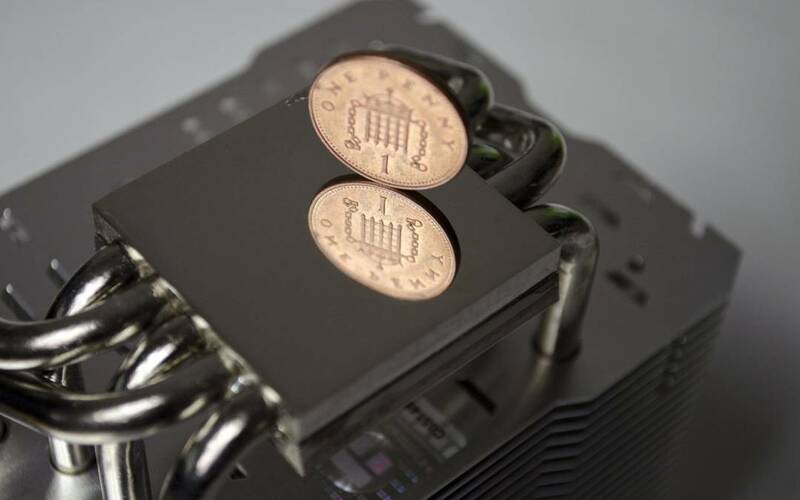 With the current abundance of air CPU coolers on the market, companies have to find their place in the market and Thermalright surely knows theirs. 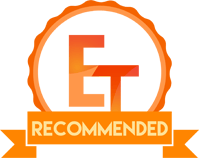 Thermalright offers great performing products at prices that won’t break the bank and can easily compete with other manufacturers. There is definitely quite a bit of cooler here for the price, there is no denying that. 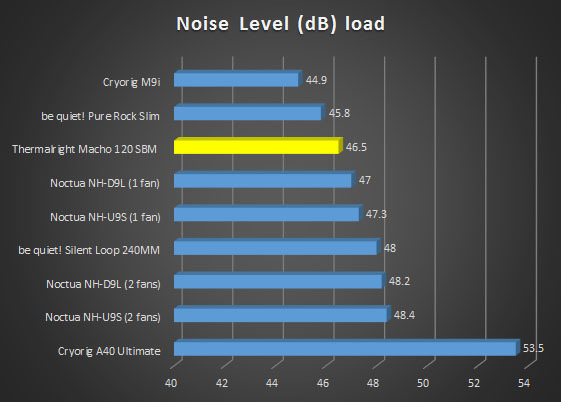 Many thanks to Thermalright for providing a sample of their Macho 120 SBM for today’s review.